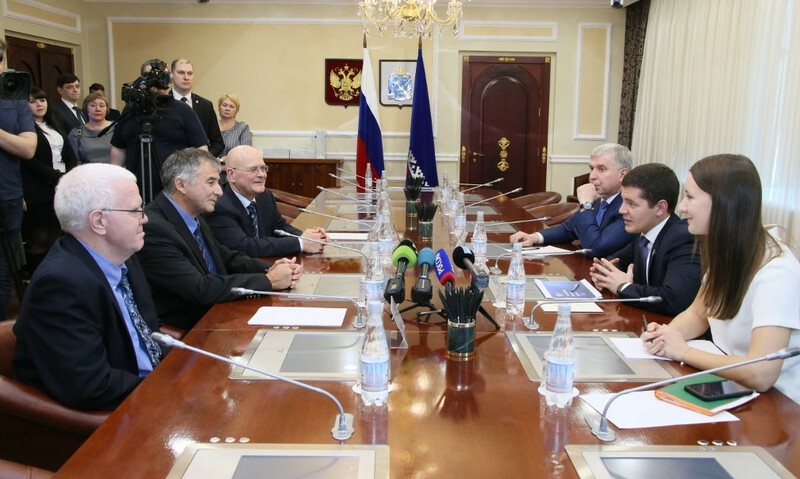 The meeting of the governor of Yamal-Nenets Autonomous Okrug Dmitry Artyukhov and the President of the Arctic Winter Games International Committee John Flynn and the representatives of the Committee took place on the 29th of March. Within two days the delegation visited sports and residential objects in Salekhard and Labytnangi. They visited the complex “Yamal-Arena” with the capacity 5000 people and town schools. There, according to the current tradition of the games, it is proposed to accommodate participants and guests. In classrooms it is promised to set bunk beds and mobile shower rooms. “Yamal is indeed a very interesting region with the unique combination of culture of indigenous peoples of the North and powerful industrial potential”, said Dmitry Artyukhov. The head of the region notes that people of Yamal love sports, in the region there are traditional and local sports, which indigenous population is engaged in. The representatives of the International Committee will be able to see firsthand sports competition skills of people of Yamal at the celebration of the Reindeer Herder’s Day in Salekhard. “Our sports objects can host the Arctic Winter Games. In the near future active construction of “Yamal-Arena” will be started. It is a large complex, including an Olympic swimming pool, a gym and many others. “Yamal-Arena” will be the central venue for international competitions”, the governor of Yamal said. The deputy head of the region, the director of the department of external relations Alexander Mazharov told that the representatives of the International Committee had arrived to assess potential of the region in organizing of competitions of this level being held before mainly in the USA, Greenland and Canada. The Charter states that the Arctic Winter Games can take place only on their territory. “For the first time in history Yamal submitted the application for the games, and the organizing committee accepted it, meeting us halfway. We are pleased that the commission arrived in the capital of the region. We hope that they will report on its results to the organizing committee, and in a year we will understand what decision will be taken”, he underlined. “To hold the Arctic Winter Games in Yamal is our dream, but let us not get ahead of the events”, the deputy governor of Yamal-Nenets Autonomous Okrug said in the conclusion.